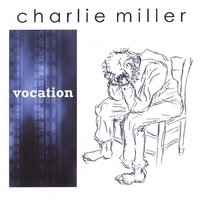 Charlie Miller's latest CD album release - "Vocation"
Charlie Miller's new release - Vocation - is now on CDBaby and ready to receive your order! Please let me know if you have any questions or want more info on this new release. How to describe this music? I'll let you be the judge. I will say that the compositional style employed was heavily influenced by Karlheinz Stockhausen and other 20th century composers who promoted sonic organization through aleatory and serialist means (Glass, Schoenberg, Stravinsky's late period, etc.). Although this describes my compositional methods, I am primarily focused on displaying my jazz and rock influences (Miles, Herbbie, Monk, Coltrane, Coleman, Hendrix). Regardless of what you might hear within this work and what you might think parts of it "sound like", I hope that above all this work holds something unique in that it is my own expression of my favorite idioms. One note on the album art. This is a sketch by my father, Terry J. Miller. He drew this after having brain tumor surgery in 1977. It represents (for me) the struggle that he went through during that time as well as the difficulty he has had with his physical and mental condition since. My dad has had quite a difficult time this past year with the passing of my mother, Linda E. Miller. This album is dedicated to both of my parents. They both showed me what it is to embrace one's vocation in life; The bad along with the good are both a part of it. Our vocation is what God calls us all to be and it is up to each of us to recognize this, embrace it, and give yourself over to it. This album is a musical interpretation of my own vocation. I hope you enjoy listening to it.